Leeds United captain Liam Cooper speaks to controversial referee Jeremy Simpson during the game with Brentford. Leeds United will feel they were robbed of top spot ahead of the latest international break after they were held to a 1-1 draw by Brentford while rivals Sheffield United and West Brom both won to climb above them in the Sky Bet Championship. While it is early days and positions do not mean anything much at this stage the Whites would be sitting at the top of the pile had referee Jeremy Simpson not been conned into giving a penalty by a blatant dive from Brentford’s Ollie Watkins as he pushed the ball round goalkeeper Bailey Peacock-Farrell and threw himself to the ground. It gave Brentford the lead with Neal Maupay putting away the spot kick and although United battled back to draw through Pontus Jansson’s late header their frustration at not winning was evident. They had more reasons to feel aggrieved at the refereeing performance as they ended with 10 men with Luke Ayling sent off for two bookable offences in the eyes of Simpson, the first of which was not clear at all. It summed up the huge inconsistencies in the official’s display after he had earlier let Brentford’s Moses Odubajo off after he had done a professional foul to rightly collect a yellow card then came up with a crunching late tackle, both on teenage debutant Jack Clarke. Furthermore none of the officials on the day managed to spot a headbutt by Sergi Canos on Ezgjan Alioski in the dugout area after the Leeds player had tried to grab the ball to avoid Brentford time wasting at a throw-in. An FA disciplinary penalty has now cleared the player of any wrongdoing, further infuriating Leeds fans who have compared the incident to one involving Eunan O’Kane last season when he was banned for three matches. Double standards certainly it seems and fuelling the conspiracy theorists around at Elland Road that the football authorities favour some clubs more than others. United head coach Marcelo Bielsa refused to have a go at the match officials afterwards as he has a policy of not doing so. Only in pre-match press conference for this match he had praised English referees so it would be interesting to know his thoughts after witnessing Simpson’s display. The frustrations cannot have been helped that while Leeds have not been given a single penalty in a year – a run of 50 games – they have now conceded nine. Who says that things even out in football? Sheffield United went top with a 1-0 win from a penalty – their third in their last three matches! It all left a bitter taste after what was a good advert for football at this level with two attacking teams both going for it in the first half. In the circumstances United did well to get a point from the game and it means they have still only lost one league match this season and they did not lose points to a team likely to be one of their rivals if they are to challenge for promotion this season. They are now likely to get the four injured players who missed the Brentford match back after the international break, but will also be hoping not to lose any more with a number of players now off to play for their countries. 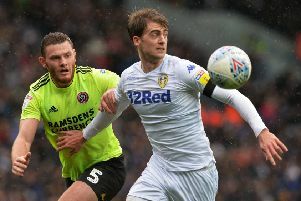 Can Bielsa’s Leeds United turn it back round in eight-game promotion run-in?